Discover unparalleled health and fitness benefits with this two-in-one swim spa. 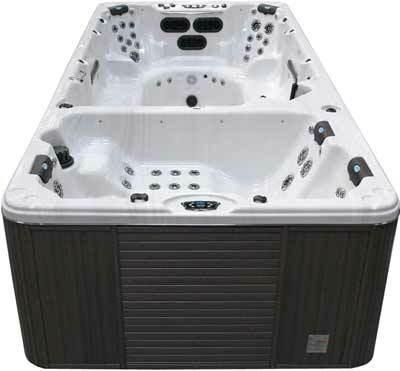 The F1770 features a swim zone for treadmill swimming and separate spa zone for relaxing hydrotherapy soaks. With the F1770 swim spa, you are able to enjoy relaxing massages in the spa zone after a long aquatic workout. With the exclusive SwimJet Propulsion System II™, you can master your stroke against this system's powerful ribbon jets. Take advantage of the optional Cal Flex™ Fitness Package for swimming, curling, rowing and much more! For all your exercise, entertainment and relaxation needs, there is no substitution for the F1770 swim spa. Enjoy the benefits of unmatched aquatic exercise and hydrotherapy with the F1770 today! Dimensions:93" x 200" x 51"